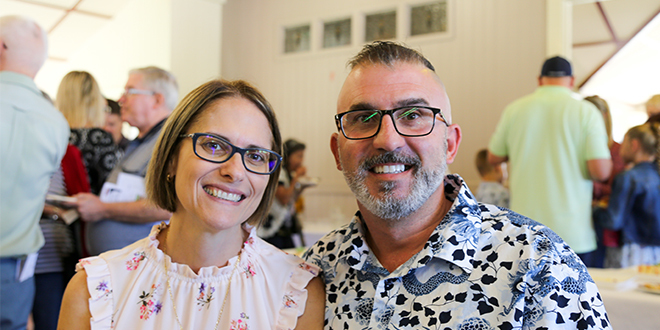 PARISHIONERS, Franciscan friars and sisters, parish school students and locals filled Little Flower Church, Kedron to celebrate 50 years of worship and community on March 31. 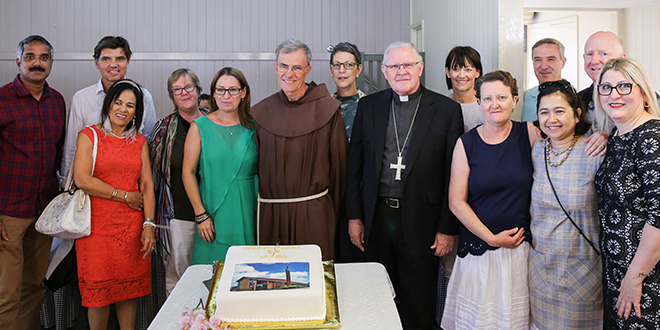 Brisbane Archbishop Mark Coleridge celebrated the anniversary Mass, joined by parish administrator Franciscan Father Mario Debattista and Franciscan Father Anthony Selvaraj in a packed church. There have been three churches where Little Flower Church stands, the current one opened in 1969 by Brisbane Archbishop Patrick O’Donnell. In his homily, Archbishop Coleridge said one thing that hadn’t changed in all the years was the little round window of the Little Flower that sat over the northern entrance of the church. He said it stood in the timber building, the first church on the site, which was swept away by a cyclone. “That church was the first church in Australia dedicated to the Little Flower (St Therese of Lisieux), so you won the gold medal in that sense,” he said. Archbishop Coleridge said the day was about rejoicing in 50 years of the church and 90 years of Franciscan work and witness in the parish. And for many, the Kedron parish was synonymous with the Franciscans. The Franciscans started the parish schools St Anthony’s Primary School, Padua College and Mt Alvernia College and oversaw both the second and the present day church on the site. Parish pair: John and Nadia Palleschi after the 50th anniversary Mass. Fr Debattista said for the relatively short time he had been with the parish, he had inherited “the good will and hard work of the friars who have gone before us”. “It’s been a wonderful day,” Fr Debattista said. Former parish priest Franciscan Father Giles Setter said it had been great to be back at the parish and catch up with people he had met so long ago. He was one of many past parish priests who were there on the day. Sitting beside Fr Setter was Franciscan Sister Clara Condon, who worked at Mt Alvernia for 10 years. She said it was great seeing past pupils come up to her and say who they are and how their lives had turned out. Long-time parishioner Margaret Casey, who first arrived in the parish in 1962, said she saw the old church go down and saw the new church built. The St Anthony’s and Mt Alvernia alumni said she was privileged to be at the church for so many big moments, which included her wedding and her brother’s. “I was able to serve today – that for me was so special,” she said. She remembered where the Padua College office is now, there was a friary, “there were probably 25 to 30 friars in there”. “We got to know them all,” she said. “We used to come up Saturday to help Fr Odoric (Fathers) do the gardening at what we called little Padua on the other side.